September 6, 2017 in COMICS / GRAPHIC NOVELS, FILM / RADIO / TELEVISION. DelRey published this very thick Essential Superman Encyclopedia in 2010. 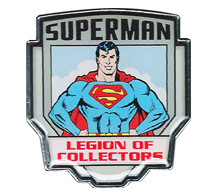 The book is full of characters, places and items from the vast Superman mythology. August 16, 2016 in BOOKS / MAGAZINES.